Using sheet metal and tin snips, you can create your own magnetic memo board for under $15 or less if you have access to scrap sheet metal. Two of these boards were punched so eyelets could be set in order to not tear the ribbon hanger. The other was edged in ribbon and had long ribbons wrapped vertically to serve as the hangers. All are topped off with marble magnets, obvs, but one is customized with chalk board paint and a cork board. 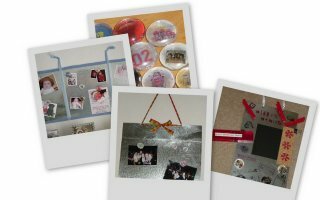 I find these boards to be very useful in displaying the ever-changing crop of baby photos I get! I like the way you set up that your adviec is the homepgae, accurately done. Thanks! Shoooooot! Commented the wrong place. Boo. Sorry!